Many of you already heard the word Passive Income. Well, if you do and haven’t really know what does it mean, passive income is an income received on a regular basis, with little effort required to maintain it. Sounds interesting, right? You are earning while doing it close to nothing. How about that? Now, your next question could be... How can I get that passive income? Before I share you the HOW allow me first to share you the WHY. These are the things I learned from Truly Rich Mentor, "The Reason Why You Need to Earn More”. “You need to earn more, so can grow more. Especially in your character. Think about it. How a person manages his money (no matter whether big or small) will reveal whether he’s gracious or greedy, honest or dishonest, loyal or disloyal. The challenge is to earn more, but not for the money. It’s about the person that you become because of the journey in earning the money. Now, let’s go back on how to earn passive income. I know 5 different ways (In fact, I am actually implementing several of these passive income opportunities). And Yes, my Tittle is correct, you can actually do several of these without quitting your job. Because of the Truly Rich Club, I am now earning passive income from Affiliate Marketing and Stock market investing. My target is to earn more from multiple streams of income. Yes you can do this without leaving your current job. Notice the images below. These are the proof of earnings from my affiliate marketing. From year 2009 up to present. This is really optional but if you also want to earn by promoting this group, then you may start doing it now. Join the Private Mentoring Group. To give you a glimpse on the 2012 Top 10 Winners of TrulyRichClub’s Stocks and the Top 10 Overall Past Winners of TrulyRichClub’s Stocks . Check the table below and look for the estimated return. Take note that some of the recommended stocks last 2012 here are already not on the current recommended list of company under Truly Rich Club Strategic Averaging Method (SAM). You can only see the actual and current recommended list once you become a member. There you go. I hope you learn from this Truly Rich Club Review. I also recommend you to join The Truly Rich Club. I want to leave you this lesson. The challenge really is to earn more, but not for the money. Don't run after the money, let the money run after you. Again, it’s about the person that you become because of the journey in earning the money. I appreciate if you can leave a decent comment below. 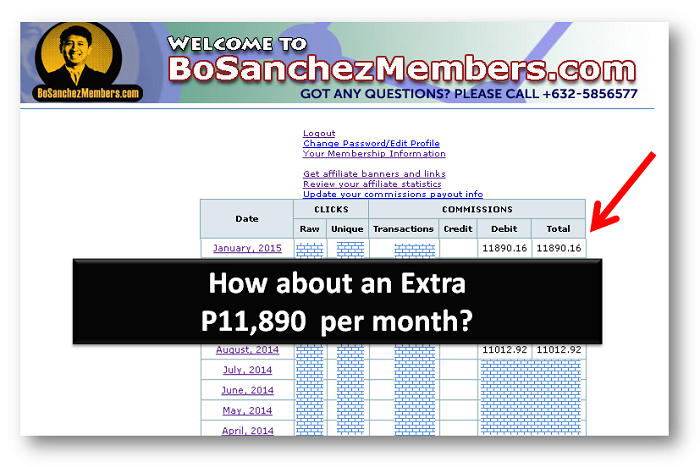 or you can ask me a questions about Bo Sanchez' private mentoring group, The Truly Rich Club. We are online mate at Jomar Hilario's online mentoring group. Let me know about this investing in stocks. That TIME HELD/ TIME HOLDING is the allocated time for our investment in that particular company then after that we will redeem our investment. So, after a few months we can get our gains. Is that the way ? Thanks for visiting this blog about Bo Sanchez' Truly Rich Club Review. Your gain in investing in stocks will depend on the performance of the companies you invested in. As you may noticed on the sample on this blog and based on Bo Sanchez TRC recommendations, the short estimated time held is 2 months with an estimated return of 17.65% (that’s an example based of performance of Ayala Corporation. Sample for the longest is FGEN with estimated time held of about 14 months and 50% return. Not bad. Red @ Truly Rich Club Review blogsite. I have been a fan of Robert Kiyosaki for some time now. Advice from the Truly Rich Club on which stocks are likely to improve would be truly helpful. It's time to put into practice the lessons learned from the Cashflow 101 Game. Go go go! Thanks for dropping by and sharing your insights in this blog. I agree. Robert Kiyosaki's CashFlow 101 (I'm adding Cashflow 202) are great simulation egame and tools for aspiring entrepreneurs and investors. I have software version of both Cashflow 101, 202 and Cashflow for Kids egames. Thanks indeed. @Achilles, based on what i learned from Truly Rich Club, there are 2 types of people in stock market investing. Trader and Investor. Trader is much riskier compared to an Investor. Traders are those risk takers who are playing on stocks by timing the market. While investor are doing it by investing in the long run. Strategic Averaging Method (SAM) is the strategy for long term investing that is recommended inside Bo Sanchez private club. SAM is same as Peso Cost Averaging wherein you put your money in a regular basis, and you'll keep doing that for years on a selected and build to last companies. I agree with you, bro. You need to understand and study it first. Sabi nga... "Don't put your money on the thing that you don't understand. Thanks Bro, I hope this help you a bit. Thank you so much for dropping a comment here in Truly Rich Club Review blog. Btw, Did you hear the news about PNB, BPI in talks to acquire majority stake in PNB? If you're interested on other form of investment, YES! 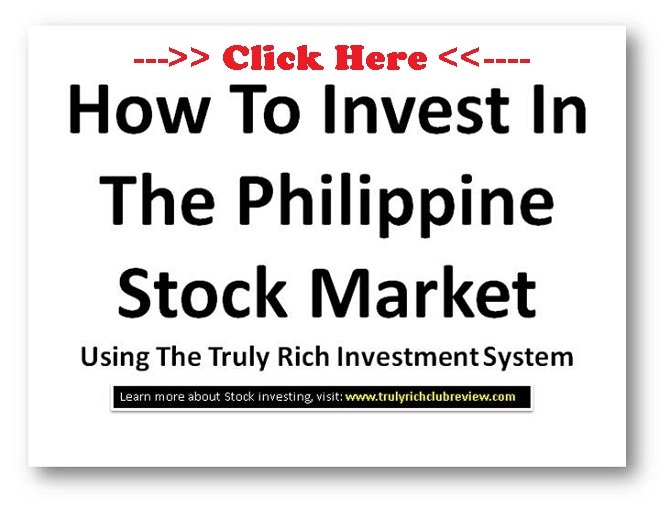 you can try Bo Sanchez SAM strategies for Stock Market Investing. For a minimum of P5000 Initial investment, you can start right away via COL Financial. Here's the thing, a lot of people are getting blind in terms of stock market investing, they don't know what company to buy, when to buy and when to sell. That's where Bo Sanchez Stocks Update will be a great help. 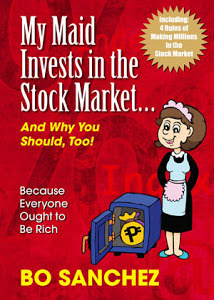 But take note and be reminded that Bo Sanchez is NOT JUST about stock market investing. We're on the same boat madam, we are investing for the future of our children... and for future of our children's children. Thanks Carlo. Yes... that's how TRC affiliate system works. Kahit sino pwede mag promote. So how's your affiliate earning? Not as big as yours though. It's all good. At least may pumapasok. Promoting and being an affiliate is really optional. Good bless bro.